Top o' the morning to ya! I'm not Irish; I don't even have a speck of Irish in me, but on 17 March, everybody is Irish! 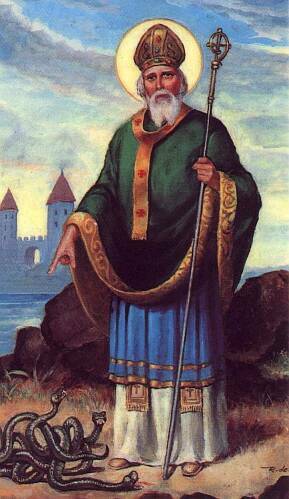 St. Patrick was 16 years old when he was taken prisoner by Irish pirates. The Roman Legions left Roman Britain, leaving the pirates to pillage and burn everything in sight. He escaped after 6 years; with Ireland burning still etched in his memory, he went to France and became a priest, then a bishop. He then returned to Ireland. According to "the One Year Book of Saints" by Reverand Clifford Stevens, he "brought the light of the Catholic faith to the Irish, converted kings, founded churches, and set up his headquarters at Armagh." His life was threatened many times...bishops resented him because of his lack of education, friends betrayed him, and other clergy in his home country criticized him. Apparently he was well into his 100's when he died. He died on 17 March, but the year is controversial, since his writings did not include a date. Last Friday, someone asked about what Catholics do if St. Patrick's Day falls on a Friday during Lent. What about the corned beef on that day? Well, from what I can tell, the Pope has to give a special dispensation for meat to be eaten on that day. I would say that it is hard to come by, so, my guess is that the corned beef has to be given up on that day. I see we were on the same page today. I AM Irish....loved The Deer's Cry video. really cool...was in Dublin last year on St. Paddy's day and it was awesome. Super interesting! Thanks! I didn't realize St. Patrick wasn't an official saint. I guess bureauracy ruled, even back then. Nevermind. It's great being Irish for a day *raises pint* cheers! Hubs has Irish on his side, there's very little on my side. Interesting info! I had never heard that song, nor seen the video, but I love both - thank you so much for posting them! Unlike you, I have mostly Irish in my blood. And I have the red hair and fair skin to prove it! But I must confess, I didn't know all this about St. Patrick - thanks again for the info. That was interesting, but I know here the Bishop (I think that's the level) gives a special dispensation to eat meat on St. Patrick's Day when it falls on a Friday in Lent. Sounds like that's not really the way it's supposed to be though. What a beautiful song, Mary. I never knew that about the "official" sainthood. Makes sense though. Happy St. Patrick's day to you! I didn't know most of this. Thanks for educating me!